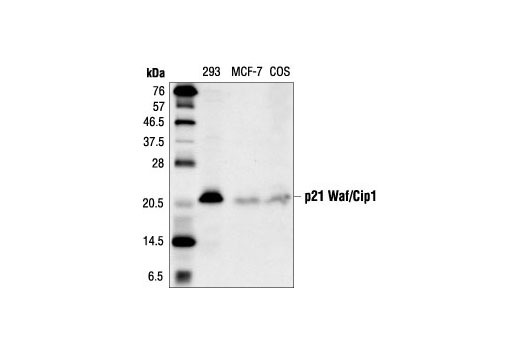 Western blot analysis of extracts from 293, MCF-7 and COS cells, using p21 Waf1/Cip1 (DCS60) Mouse mAb. Western blot analysis of extracts from 293 and Hela cells, transfected with control (-) or p21 Waf1/Cip1 (+) siRNA. p21 Waf1/Cip1 was detected using p21 Waf1/Cip1 (DCS60) Mouse Monoclonal Antibody #2946, p42 MAPK was detected using p42 MAPK (3A7) Mouse Monoclonal Antibody #9107. The p21 Waf1/Cip1 monoclonal antibody confirms silencing of p21 expression, and the p42 monoclonal antibody is used to control for loading and specificity of p21 Waf1/Cip1 siRNA. 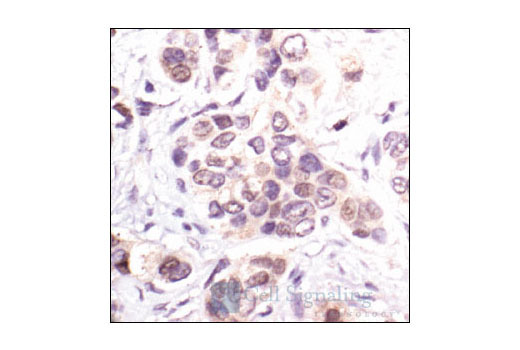 Immunohistochemical analysis of paraffin-embedded human breast carcinoma, showing nuclear and cytoplasmic localization, using p21 Waf1/Cip1 (DCS60) Mouse mAb. 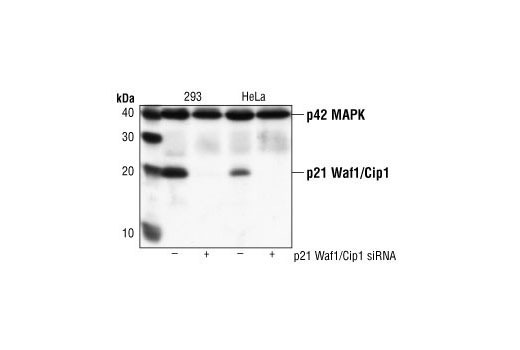 p21 Waf1/Cip1 (DCS60) Mouse mAb detects endogenous levels of total p21 protein. The antibody does not cross-react with other cdk inhibitors. Monoclonal antibody is produced by immunizing animals with recombinant human p21 corresponding to the amino-terminal portion of p21.